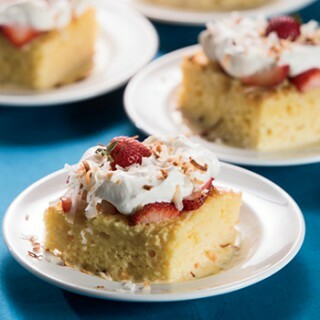 A deliciously moist dessert, this cake uses three types of milk and highlights spring strawberries. Nutrition Highlights: Just eight medium strawberries provide more than 150 percent of your daily value for the disease-fighting vitamin C.
Prepare the yellow cake according to package directions in a 13-by-9-inch baking dish. When cake is slightly cool, poke holes evenly over the surface with a toothpick or skewer. Pour each of the three milks slowly over the top. Allow each to absorb into the cake. Cover and refrigerate overnight. In a medium bowl, whip the cream using a mixer. Slowly mix in the sugar and vanilla. Layer the berries on top of the cake. Cover with whipped cream and sprinkle with coconut. Thx for sharing on Showcase Your Talent. Looks absolutely scrumptious! !